Your go-to green bean casserole is about to get a lot more gooey and crunchy this Thanksgiving thanks to Amy Erickson from Oh Bite It. For this holiday creation, Amy decided to stuff onion rings full of the green beans that so often sit uneaten while flashier items like sweet potatoes and stuffing getting devoured around them. 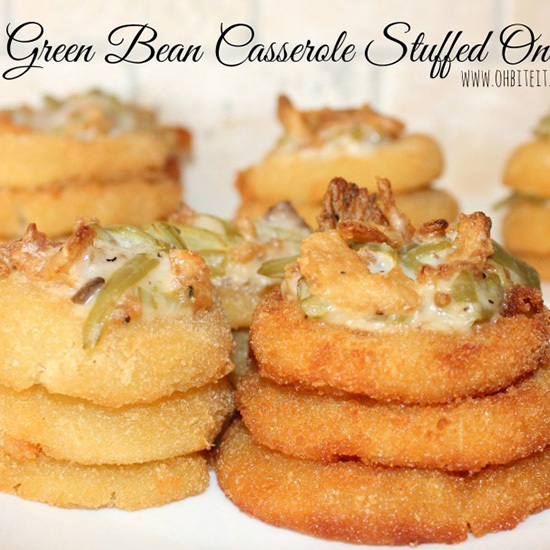 Like many of her recipes, the green bean onion stack is easy enough to pull off even under holiday duress. The casserole has just five ingredients and you can totally cheat with frozen onion rings. Or if you’re in a real hurry you can just get them at Sonic like Amy did. Assembly is easy too. Just spoon the green beans into your ring tower and bake for 20 minutes at 350 degrees. Put these out and it might be the first time in years that your family actually finishes the green bean casserole.